The characters of One Hundred Acres are showing each other what they enjoy about living to cheer their friend Eeyore up. 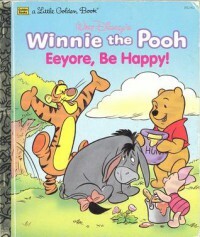 I have always felt a kinship with Eeyore, even though I have never read the original Winnie The Pooh books. Eeyore tends always be depressed, he still tried to do what each friend found happy in their own life to see if it made him happy. The fact that Eeyore is always sad does make me sad as well. He deserves at least something that gives him a smile. Which I have seen this little donkey do in the cartoons. The books I have read... not so much. I think any story with Eeyore is a big bonus. Eeyore brings a little realism by showing everyone that feelings are experienced differently by others.